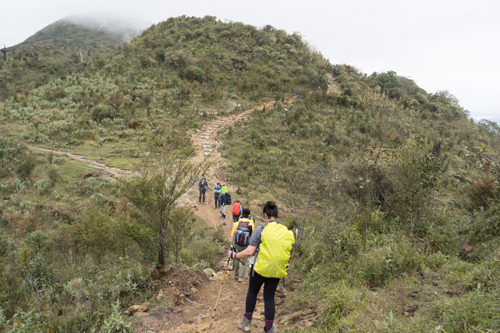 Cass Business School MBA alumni and current students recently took part in a Leadership Expedition to climb Mount Fansipan, the highest peak in IndoChina. The pilot extended Leadership Expedition came at the end of an MBA International Consulting Week which saw students paired with Vietnamese startups as well as multinational companies, to create recommendations for their clients’ business challenges. The extended Expedition was led by Dr Rodrigo Jordan, Cass Honorary Visiting Professor of Experiential Learning, and Gabriel Becker, a fellow Everest mountaineer. Dr Sionade Robinson, Associate Dean, MBA Programmes, said the extended expedition was a natural progression of the Cass MBA strategy to develop a more adventurous MBA program to develop an explorer's mindset and enable our students to read and respond to rapidly changing business environments. “The pilot expedition was a perfect example of how we are strengthening our MBA community of students and alumni with shared stretch experiences as we put our strategy into practice,” she said. Dr Robinson took part in the extended Expedition in April and reflected on her own leadership lessons in a LinkedIn post. Archna Luthra, Modular Executive MBA student, said the Expedition proved challenging but ultimately rewarding. “Climbing Mount Fanispan together created a context to explore our and hone our leadership skills. And it certainly was stretching – quite literally when we attempted to scale some of the sheer rock faces! It also offered a unique opportunity for reflective learning. After each day, we took time to consider how the day had gone, how we had worked as a team and what we would do differently. And there’s nothing like a steep climb to bring team dynamics and leadership into focus. The pilot group was so inspired by their experience that they have formed a new society – the Cass MBA Expeditionary Society – to bring alumni and students together to explore leadership through experience. The Society will formally launch on Wednesday 20th September with an exclusive MBA Leadership Masterclasses with mountaineering legend Sir Chris Bonington. You can get a taste of the pilot Mount Fansipan Expedition here. The MBA Leadership Masterclass is on Wednesday 20th September at 6.30 pm in the Auditorium at Cass Business School, Bunhill Row. Please register here.